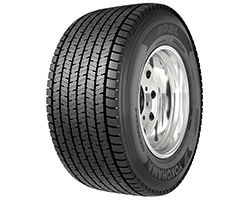 Yokohama Tire’s max-mileage 902L™ ultra wide base (UWB) long-haul/regional drive tire is now available in a new size: 455/55R22.5. -- Long, even wear is assured by the deep 27/32 tread depth that creates higher traction while providing extra-long treadlife. Plus, the optimal eight-rib block and sipe tread design contribute to enhanced lateral stability. -- Enhanced fuel efficiency and traction are insured via the advanced rubber compound that lowers rolling resistance and reduces heat build-up. Also, the specially engineered small block and sipe combo reduce heel-toe wear to increase fuel economy and provide increased snow traction. -- Significant increased retreadability is made possible by Yokohama’s advanced casing design, which is created specifically to reduce strain and prevent casing growth, allowing retread after retread.